So you've finally settled in to your role as a new parent; you think you have mastered most of the tasks required to hold you over until your little bundle of joy heads off to preschool... then you come face to face with your first vacation with your baby! Whether your child is weeks old or starting to crawl, your first vacation can be a big wake up call! Gone are the days of throwing a few essentials in a small case for a week-long getaway! But there's no need to panic; with a little organization and planning, you can be ready for whatever comes along! Making a list will save you a lot of frustration and time. You'll want to pack to address everything from your child's health, to his or her day-to-day needs in terms of feedings, elimination, entertainment, safety, and comfort. Much of what you will need to pack will be determined by your destination, but the goal is to pack as efficiently as possible, minimizing the amount of unnecessary gear you bring along. In addition, you will need to address some basic health and safety precautions before you set out on your adventure. Scheduling your journey during your child's nap or bedtime is a great idea - after all, the more time your child spends sleeping during the journey, the less time you will need to occupy with play or other distractions! Just remember to bring along comfortable pajamas, books, or anything else that is a part of your usual routine. If you are travelling with an infant, it is important to check with your pediatrician to be sure your child has had all necessary inoculations. Babies do not have fully formed immune systems and are far more susceptible to contracting illnesses than adults. In addition, it is always a good idea to pack any medications your child may require in a bag that will be easily accessible during the journey. A carry-on or diaper bag is a good choice; beware though, if you are flying you will need to familiarize yourself with the limits regarding how much liquid you may carry on with you. Packing clothes is relatively simple: a good rule of thumb is to pack a few more outfits than your baby would go through at home, and remember it never hurts to pack a few extra pajamas, socks and onesies! For extended trips, you may want to check with your lodging provider to see if they have laundry facilities. What you spend doing laundry you will easily save in excess luggage fees. For the majority of destinations, it is safe to assume that you will be able to acquire diapers, wipes, ointment, etc. once you arrive. But plan to pack enough for the flight or drive, plus a few extras for any unforeseen accidents or travel delays. Travelling without toys to occupy your child will inevitably result in disaster. Pack a wide variety to keep baby distracted along the way, including old stand-bys and a few new surprises! Avoid bringing noisy toys or items that could prove annoying to fellow travelers. The less gear you need to haul, the happier you will be, so look for items that can serve multiple purposes (i.e. a car-seat that converts to a stroller, a pack and play that can be used as both a play pen and for sleeping etc.). Another alternative is to explore the availability of rental gear; many popular vacation destinations have local companies that offer car seats, strollers, or other baby gear that you can borrow for the duration of your stay for less than it may cost to lug all that gear on a plane. Also, many lodging providers now offer cribs, play yards, etc. upon request, which can help cut down on what you need to haul! Most lodging is designed primarily with adults in mind, often overlooking the safety or comfort of young travellers, particularly newly mobile babies or toddlers. So upon arrival, plan to do a quick evaluation of your room; you may need to rearrange furniture to make play space and remove decorative items that could pose a hazard to your little explorer. You will also want to bring along some basic child-proofing devices to child-proof your hotel room. 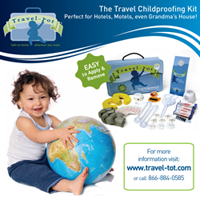 The Travel-Tot Childproofing Kit is an ideal option with it's broad range of deterrent devices (outlet covers, corner guards, foam door pinch guard, multipurpose straps, cord guard etc.). The Kit components that require installation are specially designed not to harm surfaces; each piece goes on strong but comes off clean thanks to the 3-M temporary adhesive strips - you can even re-use many of the pieces! The Kit provides a layer of protection between your child and common hazards, while simultaneously affording you the peace of mind of knowing you won't be incurring extra expenses due to inadvertent damage to hotel property! Boutique of the Week: Wild Child! Surviving a Long Flight With Children!